← Do You Equate Money with Affection? I don’t know about your kids but friends of mine’s kids wanted to try lots of different activities before finding ones that became favorites that they then stuck with. Each time they took up something new, it meant new uniforms and equipment. Have you noticed that no two activities seem to use the same equipment? It can run into a lot of money but my friends found some ways to save money on sports equipment for their kids over the years that I would like to share with you. The first tip is to find out from the coach exactly what is required and what is accepted for that sport. Things may have changed since you participated in the activity as a kid and you don’t want to be wasting money on the wrong gear. There will probably be a uniform and equipment list issued but if not, make sure you ask. They had a rule that, if they started a new hobby, activity or sport, their kids had to see it through and stay with it for the full season or course or school year, depending on what it was. While this did limit the amount of chopping and changing, it still has meant lots of new equipment and uniforms over the years. They have quite a collection at their house and this is the second tip for making some savings – don’t throw anything away when your child loses interest or wants to try something new. Find a clean dry spot to store what is no longer being used, making sure it is clean and in good condition before you put it away, so it’s ready to be passed on to another child. Remember, there are lots of other parents out there in the same predicament of trying to manage a family budget while giving their kids as many opportunities and experiences as possible. You may have the equipment they need to outfit their child so you could sell or swap it for something you need. So keep those out-grown uniforms and no longer needed bats and balls and use them to fund new purchases. The same applies when you are outfitting your youngster for a new sport; there’s sure to be the equipment you need hiding in someone else’s garage or basement so it pays to ask around or advertise locally. Make sure you inspect the equipment before deciding to take it, to make sure it is in good conditions and is suitable for the activity your child needs it for. Check with your child’s coach that what you have found is suitable and acceptable. Many sporting clubs and organizations run a used equipment and clothing pool where they sell on second-hand gear. Sometimes parents donate the goods but often you will get the price they sell for, with the club keeping a small percentage as a fundraising activity. What you get for selling last year’s uniform will help to pay for a new set. When you register your child, ask about secondhand gear that might be available. 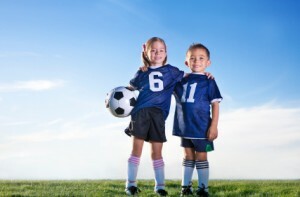 Talk to other parents whose children belong to the same team or club; they may have been playing the sport for a while and have outgrown uniforms or equipment that isn’t being used any more. Offer to pay but many people are happy that someone can use what they no longer need. Some sports require more extensive equipment that can be quite costly. It is often possible to hire some items to reduce the cost of the initial outlay. This is what my friends did when their kids wanted to learn a new musical instrument – they paid hire fees until they were sure they would stick with the instrument. You can sometimes find a hire to buy deal where the hiring fee actually pays off the equipment over a period of time. It is certainly worth the time and effort to check out what options are available. You may know someone whose child has played the sport in the past and will be happy for you to borrow some pieces of equipment until you are sure that your child will be sticking with it. My friends didn’t mind buying the stuff so much as the waste when the kids didn’t want to continue with it after the season was over. We all want the best for our kids, and for them to have a well-rounded upbringing, but it can be tough financially allowing them to be involved in everything they want to try. Hopefully, some of these ways in which you can save on sports equipment for kids will help, while still allowing them the opportunities and enjoyment that playing sports or being in involved in various activities can provide. I just got an email for a special 25% day for BASEBALL equipment for the summer 2014 season. Crazy….but I’ll be there as my son refuses to stop growing. Good luck at the sale. Eventually he will stop growing. I got used equipment a lot when I was a kid. There was a play it again sports store that sold used gear that we always tried to buy from first. I did get a brand new FIFA soccer ball one year for my birthday. That was sweet and super expensive come to think of it. It is good when cities have those kinds of stores. We have them hear and I definitely plan on using them. We have the “you have to stick with it for the year” rule as well. Our son has gone from chess club (that’s a sport, right? ), to gymnastics, to swim team, to karate, to cross-country running (he did a kid’s triathlon during the summer and a half marathon just a couple weeks ago), to track & field. And he’s only 12. I like that rule and I think it makes sense. I am going to steal it from you when I have kids. Growing up I had a lot of second hand equipment I didn’t know any better. I’m sure this saved my parents a lot of money which allowed me to play and participate in many different sports. You are right. Great point. If you can save here you can spend there. Both of our daughters were dancers and both spent more than ten years in formal lessons. We chose a studio that included parents in recital costume selection. We never paid more than $70 for a costume and if your child was in more than one class, they capped the cost of multiple costumes at $35 and the studio picked up the rest. By contrast, a friend allowed her daughter to get involved in competition level dance and told me last year when our daughters were both graduating from the dance program at our local high school for performing arts, that she had spent more money on costumes, classes and competition fees/travel than her daughter’s college education would cost. I was stunned. Wow. That is crazy. It sounds like the school you went to have a reasonable process in place to keep things affordable. If only all places could be like that. “Hand-me-downs” were built into my childhood. We were grateful to get what we needed and my folks were thrilled to be able to give it! Swap the school equipments,music equioments and other products. Save your money and take new products on replace of old products.